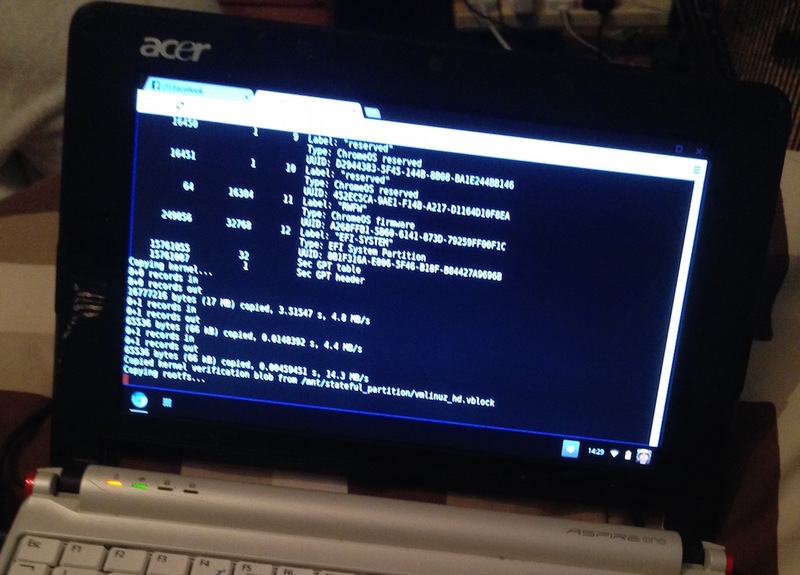 I’ve been struggling with my spare ageing netbook for a while, an Acer Aspire One ZG5. It has fairly good specs with a 1.66 GHz Intel Atom processor and 1.5 GB RAM, but the SSD is a poor performer, and at only 8GB storage it limits me to what I can put on it. I’ve been running LXLE – a lightweight Linux distro – on it, and it handles well, but as lightweight as it is, it is still a full OS that uses resources and drive space. Google initially released Chromebooks back in 2011, but it wasn’t until 2013 when they dramatically dropped the price and released some new models, that the craze took off. The low specs of Chromebooks might put people off, but ChromeOS isn’t like any other system. It is a very thin operating system based largely around the Chrome web browser and primarily an online system using web-based apps and cloud storage, which has grown to include offline working too. This makes it very light on resources. Google builds ChromeOS for their own hardware. 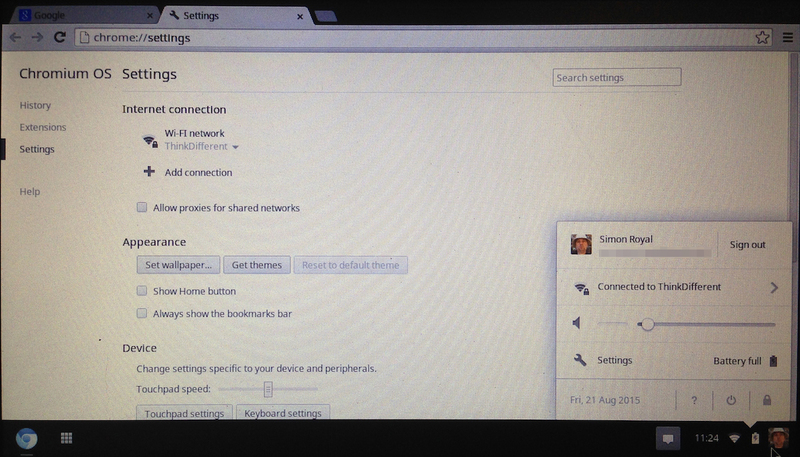 However, Chromium OS is a freely available open-source version for x86 and ARM devices, and it is based on Linux. Both feature the same thin OS, same use of your Google account – in fact, after signing in to Chromium OS I got an email saying my account was used to sign in to ChromeOS – and same access to apps, App Store, and background updates. Both look almost identical with just a few minor graphical changes. Chromebooks are cheap and simple devices (with the exception of the Pixel) aimed at those wanting a no frills internet machine, without the hassles of a full blown OS such as Windows or Mac OS X.
ChromeOS and Chromium OS offer a safe haven, a system that is barebones where system updates and malware protection are silently done in the background without any user intervention. All data is stored online and controlled by your Google account. You could quite simply use a Chromebook, dump it in a river, and then sign in on another machine and carry on. Want to give it a try? Here is how. Head over to the Hexxeh site for Chromium OS builds and download the latest Vanilla. Download the img file and, depending on what OS you are using will determine on how to create a bootable USB stick. The Mac version of the USB creator seems to be broken for anything over Mac OS X 10.7. According to some forums, you need version 2.0.1, but all I can find to download is 0.9.7. I decided to create mine on Linux using the command line outline on the Hexxeh page, which was fairly easy. You could also try using the unetbootin tool to create a boot USB stick in Linux. You can also use Windows, which comes with its own tool, of course. Once done, simply boot from the USB stick in the machine you want to try Chromium OS on – you might need to change your boot order – and test it out. Sign in and start using it. Type install and press Enter. I wanted to wipe what was on the netbook and give the whole drive to ChromiumOS, so it was straightforward, but it is possible to dual boot too. Installation is easy – just sit back and watch the text-based installer, and once finished, reboot without the USB stick in. On first boot you will need to set up the machine again, answering a few questions and signing in. Accounts are managed via Google accounts, so you will need one of these. It does support multiple users but has no fast user switching – although, according to this Google support page, it should be possible. So if you want to share it with another person you have to sign out and then sign in to another Google account. There isn’t much to the OS. This is purposeful. There is a task bar running along the bottom. On the left side is a shortcut to the browser, then there is a Start Menu that brings up the browser, app store, and file explorer. On the right side you will see your notification icon and then a small panel that houses the clock, network status, battery/power status, and user profile. Clicking on this gives you access to users, wireless networks, sound control, OS settings – which are minimal to say the least – and where you log out of that user. My netbook didn’t seem to have a desktop wallpaper, and looking around the web others using ChromiumOS have this missing too. A small point, but it does give the feel of a dull look. You can make use and access external drives, which is handy for local storage. This could be an external hard drive or, in the case of my netbook, which has two card slots, it could be an SD card. You can also change the default download location, if you go in to Settings and under advanced settings change it where you want. It could even be a USB stick or SD card. Booting on my hardware was fairly quick. It took just 23 seconds to get to the login screen. Chromebooks are praised for their boot speeds with some booting in under 10 seconds. One thing to note you can get to a command prompt, which gives you access to a cli for ssh and other basic commands. Apps are browser-based, but it seems you need the Chrome browser to install apps from the Store. However, ChromiumOS comes with Chromium browser, and the Store doesn’t like it, complaining Your Chrome version is not supported by the Web Store, Download the latest Google Chrome. This could be a clincher if you were looking to expand the usability of your device, and something I will further look into. 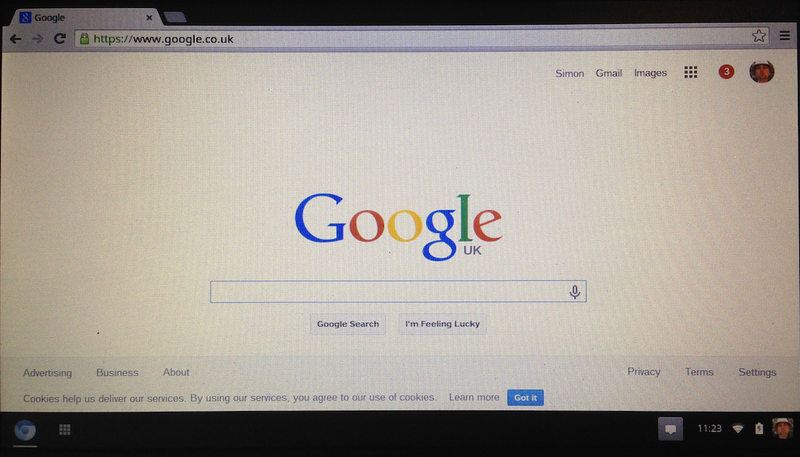 Chromebooks do not have this issue, as they run ChromeOS with Chrome browser. If you have a machine sitting around that you want to use on the Net, Chromium OS could be the answer for you. Or perhaps you want to give a child or a friend/relative a simple machine purely for keeping in touch online without the continuous ‘free tech support’ that comes with a Windows machine or Mac, then a machine loaded with Chromium OS or even a genuine Chomebook could be the answer. I will keeping ChromiumOS on my little network, as it is by far the fastest OS I have tried on it. It has made me think more fondly about getting a Chromebook – just as a second machine or just for a hassle free Internet device. I would like to give a big thanks to Carl Draper for looking over this article before publishing and for offering some corrections and additions to it.